I was born into a BB family and later married into a BB family. I think it would be safe to say that The Boys’ Brigade is fixed in my DNA. The BB has been and remains a huge part of the Snowden family life. In the early months of 2016 I was invited to be the Chaplain for the 2016/17 KGVI Youth Leader Training Course. Having reluctantly accepted and fearing that I might not have what it takes to step up to the task, I began what became my KGVI journey. 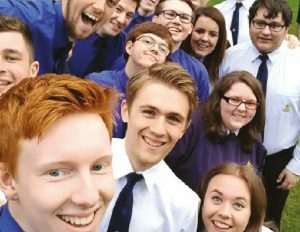 Over the past two summers of my chaplaincy I have learnt so much about The Boys’ Brigade, the future of the churches we work in, and what it means for the young people to be growing up and then becoming leaders in their BB and Church setting. In that time, I have had the enormous privilege of witnessing the growth and development of the young people attending KGVI. There was growth in maturity, confidence and faith. Some young men and women encountering God for themselves for the first time in a very real way. These young people arrived on the course as fearful, subdued individuals and emerged as confident, mature, collaborative leaders, hungry to learn more and willing to share all that they had experienced. We had truly become family. Part of the KGVI family, but more vitally, ready and willing to take our place in the family of God and in the family of the Church! Big questions and big concerns. I believe that I have witnessed the future of the Brigade and the future of our Churches in the making. It is our responsibility as leaders already in active service, to recognise this for ourselves. We need to be responsible for providing opportunities to encourage their growth and development as leaders. Then, along with some essential pastoral care and guidance, help them to find their place within the life and leadership in the body of Christ to which God is calling them. Sue Snowden is an Officer in the 59th Manchester Company and last year took on the role of Chaplain for Manchester Battalion. Sue began her career as a teacher of children with special needs, but for the past 10 years has been a Lay worker for the Methodist Church, with responsibility for Church Development and Pastoral Support in the Bolton Circuit. Sue is also a Local Preacher and enjoys leading worship around the churches of the Bolton Circuit and beyond. Sue is married to Ken, they have two children Amy and William who are both far more grown up than they would like to admit. 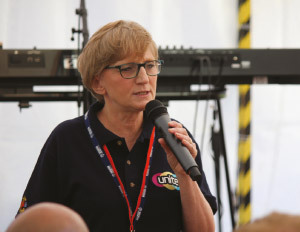 In her role as Chaplain for Manchester Battalion, Sue led the opening devotions at this year’s Brigade Conference held in Manchester and created a blog earlier this year, which provides a weekly message of encouragement for the leaders in the Battalion and others far and wide who care to take a look.